So… the hot DNA news from the Federation of Genealogical Societies conference in Fort Wayne! Oh, a couple of wonderful things on the personal DNA front: I got to meet, in person, two of my DNA cousins. Being able to say hello to both of them — to put faces to the names and to know that there are real people with big friendly smiles behind the segments of the chromosomes — is a treat that’s hard to explain. The instant bonding of kin is one of those things, I suspect, where you just have to be there to really understand it. But there just wasn’t one single solitary thing “new” in terms of DNA that came out of the conference. • There will be a “major revision” of the ethnicity results for AncestryDNA customers later this year. And, yes, most of us should see some fairly significant changes in the numbers particularly if we’ve been sitting there scratching our heads about the percentage of Scandinavian showing up in those results. • AncestryDNA is well aware that limiting the ability to compare DNA results to the tree-matching is not sitting well with the genetic genealogy community and they are working diligently on what they believe will be “something even better” than a chromosome browser. And, no, nobody at AncestryDNA is giving so much as a hint as to what that might be, what it might look like or how it might work. And the very fact that there wasn’t any hot news at the FGS conference makes you think that, perhaps, at least to some degree, we’re getting to the point that DNA testing is just one more in a long line of genealogical tools that are known to and used by genealogists. Thinking back only a very few years, being able to search the United States census online, on our own computers, in our own homes, was a huge event — a major technological breakthrough. It was hot news! And now it’s just one more of those tools — so much a matter of routine that nobody even thinks about it any more. Are we getting to that point in DNA testing? Are folks starting to consider it as just one more tool that, of course, everybody does — or at least wants to do when they get around to it? What say you, loyal readers? Have you DNA tested yet? If not, why not? I’ve never found Ancestry.com to be very forthcoming with the general public about updates/upgrades. This is something that I’ve found extremely frustrating. But at this point, with all three major companies priced at $99, I think it’s time that they step up their game. Having tested with all three, I find that they all offer something unique. But Ancestry’s tree matches (which are buggy and after a year still don’t work properly) aren’t enough to get me to purchase another test from them. I feel that they should have had a chromosome viewer to start with. I hope that they really do come out with something amazing, but I’m not holding my breath. I think we’re all in the same boat, Valerie — hoping against hope that whatever they do is exciting and useful. We’ll just have to wait and see. I tested with FTdna a few weeks ago. Waiting for results. Wondering if it was a waste of money. I don’t think testing is ever a waste of money, Linda, even if it doesn’t tell you something new and exciting right now. It’s a way to ensure that you’ve covered all the bases, including the possibility of meeting new cousins who may have the keys to a brickwall problem. And it may be years before that cousin with those keys tests. Which is why it’s important to keep checking back every so often. Nice piece Judy and I’m not surprised about AncestryDNA. I do not think that most genealogists are using DNA as one of their tools. Was there a class on it at the FGS? If not, then that is the issue here. No news can very well be that there is nothing new presently or on the horizon, but I firmly believe we have much more work to do in getting the genealogy public using DNA. They have heard of it, maybe watch WDYTYA (which uses DNA only some times), but actively using it, not in my opinion. I just did a seminar at my local society and although I have run a DNA interest group there for years, there were still people who were new to DNA testing. That is one little corner of my state, actually a town and a few outlying areas. 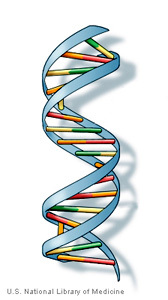 IMO, every national genealogy gathering should have beginning DNA classes available…and maybe they do? Emily, all of the conferences do have DNA presentations and this one was no exception. There were four ranging from introductory through autosomal — and every time I walked past the FTDNA booth or the AncestryDNA booth, they were busy. But it seems we’re in a lull perhaps before the next breakthrough? I have tested with FTdna (mtDNA, 2002) and 23&Me (2013) but have decided not to do the Ancestry one until they get their act together. My father and only brother are deceased so I had my brother’s son tested at FTdna (Y dna, 2007) and am toying with talking him into 23&Me. I find it all very interesting but not really genealogically informative and I didn’t expect I would. The 23&Me did find the Native American gene which, to me, confirmed a long standing family story about a female ancestor about 4 generations ago. Glad you did get that bit of immediate use out of your testing, Dotty! I have tested with the 3 major companies (23andMe, Ancestry, and FTDNA), plus the original National Geographic project. I haven’t gotten much out of them, I’m sorry to say. I have 996 matches with Ancestry, yet either I already knew my close relatives or the people don’t respond. I don’t know what to do with the hundreds of distant cousins. The ones I’ve corresponded with are stuck at the same brick wall that I am. Like Randy Seaver of GeneaMusings, I’m confused by the conflicting results about my origins. It looks like gedmatch.com might be interesting. I’m not really sure what more I can do with the results. I’m keeping alert for blog posts and other news about what to do with DNA results. Bottom line, DNA testing hasn’t helped me yet with my brick walls, which are in the 1700s. I know lots of people haven’t tested yet. Privacy issues (what are companies doing with our DNA?) and cost are the two main reasons I’ve heard, plus it seems complex to understand. Those very early ancestors are certainly tough ones, Barbara. Sometimes it’s just going to be impossible for DNA to answer the question. If what you need is a male to test for YDNA and the line has daughtered out, it’s just not possible. My husband and I have both had our gender related DNA tested by FtDNA but as yet have not had any significant matches. But at least our data is out there and since patience is one of the virtues of genealogy (grin) we will wait and see. We did take advantage of the recent pricing special from FtDNA to do the autosomal. Nothing for hubby but I got an email from a potential cousin who might just be the key to a major brick wall. We still have to do old-fashioned research to confirm the connection but it’s the science that brought us together. I think as more and more success stories are shared we might get more folks to take the tests. Oh, Pat… you’ve hit the nail absolutely on the head: “patience is one of the virtues of genealogy” could not be truer anywhere than with DNA testing. I wrote — last week? the week before? — about the very first match at 23andMe that I have made. It was two and a half years after I tested there! I’m at this point, too. Have had several lines tested and hope someone matches one of these days! It does happen eventually, Judy, especially if your family has been in the US long enough. It’s much harder for those descended from recent immigrants because so many fewer Europeans test with any of the three companies we’re familiar with here. Anybody want to speculate about what ‘ “something even better” than a chromosome browser’ could be? I have no idea. There hasn’t even been a hint, Lou. I have no idea what this might be. Thanks for the update! I can see huge potential to go beyond the chromosone browser, especially higher-level tools that automatically leverage the trees as well as the DNA data. If Ancestry.com has something good under development, I think they would be fools to talk publicly about it, for both competitive and patent reasons. I’m looking forward to using it when it’s ready, or even beta testing it when it’s not quite ready. Things are looking up with the recent Ancestry.com site changes actually being substantial usability improvements, vs. the earlier unimpressive changes they made in the past year or so. All we can do is wait and see, Michael. 11% is a pretty big chunk of uncertainty. Genealogically I’m more than half German & German-Bohemian, 25% Norwegian, 12.5% British, ~3% French & ~3% Native American (confirmed, not rumored). So unlike a lot of people, I was expecting more Scandinavian & less British Isles. It didn’t pick up my Native American but I’ve seen it with different tools on GedMatch. I’ve definitely gotten better matches for my husband so apparently he has more relatives that have tested. I have yet to actually have it help me with any brick walls though. I’d like to get my dad & great-aunt get tested & see if possibly theirs could help with a few of those being farther back. Oh wow. That IS a very high percentage of uncertain! You’ll have to let us know what you see when the change occurs later this year! Ancestry made the choice to report any “ethnicities” under 5% as uncertain. If yours is 11%, that means you have at least three more, separate “ethnicities” they didn’t break down any further. It will sure be interesting to see how — if? — that changes, Nathan. My DNA has been analyzed at 2 labs, 23andME and FamilyTreeDNA. The results from my perspective have been somewhat underwhelming. I have hundreds of potential matches through FTDNA (Y, Mt and autosomal) and I’ve attempted to communicate with several of them but the response rate has been a near flat line! The 23andMe results were somewhat more interesting in that the medical information is so personal. There’s nothing particularly dramatic which, I suppose, is reassuring….if it’s accurate! I’ve uploaded to GEDMatch and NatGeo but I rarely get any real, useful information. The only solid connection I’ve made is to an author who lives here in Western Massachusetts with whom I share a common family name. We haven’t figured out the exact connection, but our ancestors hail from the same geographic area dating back to the early 19th century. Dave, it’s often a very long dry slog before the first really useful match occurs UNLESS you do targeted testing. By that, I mean testing designed to see if there’s truth to a particular theory. The very FIRST testing I did was targeted: we had a theory that a particular couple in Mississippi were the parents of our second great grandmother and tested not only members of my family but members of families known to descend from that couple. 1) extensive tree including as many siblings and marriages of siblings as you can find. 6) use the new search tools to locate matches with people living in the same town, county etc. If you are on 23andme have a look at my thread.https://www.23andme.com/you/community/thread/21347/ I believe it is longest running thread on 23andMe at 14 parts long and there’s plenty of the good, bad and ugly of ANCESTRY but definitely more good than anything. So I advise not not being too quick to dismiss it. Thanks so much for your game plan, Kelly! The AncestryDNA product is not currently available for purchase outside of the United States. As a valued Ancestry.com customer, you will be notified once AncestryDNA is available in your country. Seems this would limit the ability to compare your DNA and possibly find the geographic source. It does, yes, and it may turn out to be an “incurable” limitation since as I understand it part of the problem is that the test sample is saliva rather than just a scrape the way FTDNA samples. There are parts of the world where saliva is simply regarded as something that can’t be mailed easily or cheaply — or at all. One of the ftDNA people told me that they would have an update to the ethnic population part of their test later this year also. Also, she said that a large portion of the people who’d tested to have British ancestry, also had a small percentage of Middle Eastern show up as well. She said that didn’t necessarily mean a Jewish ancestor, as I had assumed. I begged her not to deny me my mystery Jewish ancestor! As for dna testing, I LOVE it and have found several clues, several affirming matches, and a few new ancestors from the FamilyFinder test. I sure wish I’d had more time with you and Kay, Karen! Next conference, we’ll have to set some time aside, for sure! Awww… thanks for the kind words. My mother, my brother, and I have all done autosomal testing on AncestryDNA. My brother has done Y-DNA testing and I’ve done mt-DNA testing on Family Tree DNA. Plus, I’ve transferred all of our AncestryDNA autosomal testing results to Family Tree DNA. For us, the DNA testing has been a great success! One of the great mysteries of my mother’s family was who the wife of her 3x greatgrandfather was. The paper documentation trail was inconclusive, indicating that she could have been one of two women, though I had my suspicions as to which it was. Both women had their advocates among my extended cousins. Through my family’s at-DNA results, it was pretty obvious which women was our ancestor…and, yes, I guessed right. I’m hoping to write an article on this at some point. All three of us were DNA matches for numerous descendants of several of her siblings. Additionally, I was recently contacted by someone who was adopted at birth and is searching for his biological family. FTDNA matches us as being 3rd or 4th cousins and I’m thrilled to be able to help. I wholeheartedly agree with Kelly Wheaton’s list. I send out a lot of email to matches on AncestryDNA; some but not as many on FTDNA. Does everyone respond? Not even close. But enough have responded that I’ve been able to answer a few other questions, gotten photos I never would have had access to, and hints on additional documents that exist in places I wouldn’t have thought to look. I also try to respond to every inquiry I get. I can’t always provide the answer that is hoped for but I try to be helpful. All in all, I have found it to be a positive experience and encourage everyone to give it a try. Now if I could get my aunt to do the testing, I’d be ecstatic!! Let’s see what we can do to twist your aunt’s arm, Teresa!